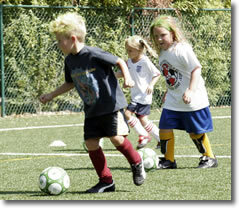 U6 Fussball Academy is for players ages 5 and 6. These camps focus on basic soccer skills and team concepts in a fun and nurturing atmosphere. Mornings are dedicated to playful games that teach all the fundamentals of soccer and the afternoons focus on small sided matches that instill fun, passion and team concept. Our coaches are well trained and will provide a camp that is fun and challenging at every level of play. To ensure proper training our coach to player ratio is 1: 10 or less. We offer a half-day (9:30am - 12:30pm) and a full day (9:30am-3:00pm) camp option. of soccer : passing, dribbling, shooting, trapping etc.